The effects is just for testing now so i put all of them in one .fxp, Later when they are successful i will do different versions for everybody . Do you know how to improve the firenar with some flames on the back, like the firenar2 ? Well, all the effects works, The only problem is to make them compatible with the cleo scripts. So i tested the laser on PMC, it should work now i guess. Will you also include the afterburner and sound barrier effects that NGE included? Sure, i did my own version of them. The laser looks good in-game (when I could see it lol) but could you make it longer? Like at a length of 500m (or whatever units SA uses). It's also got some flickering problems and I can't see it sometimes. Not sure if it's a problem with the script or the effects. Nice can you post some screenies? Heh I tried copying and pasting those lines into effects.fxp and my game crashed when I used the tlaser script. I'm not cut out for effects modding it seems so I'll just wait for the finished effects.fxp. sorry, my mistake.. was a little strange (I think ) I had to limit my fps to see the particles..
can you make another effect like this one but smaller, xD like firenar2 ?? can you make this effect? Anyone a superman fan here? Would be cool to add those lasers coming from his eyes and finally make it proper. Hmm, nice. 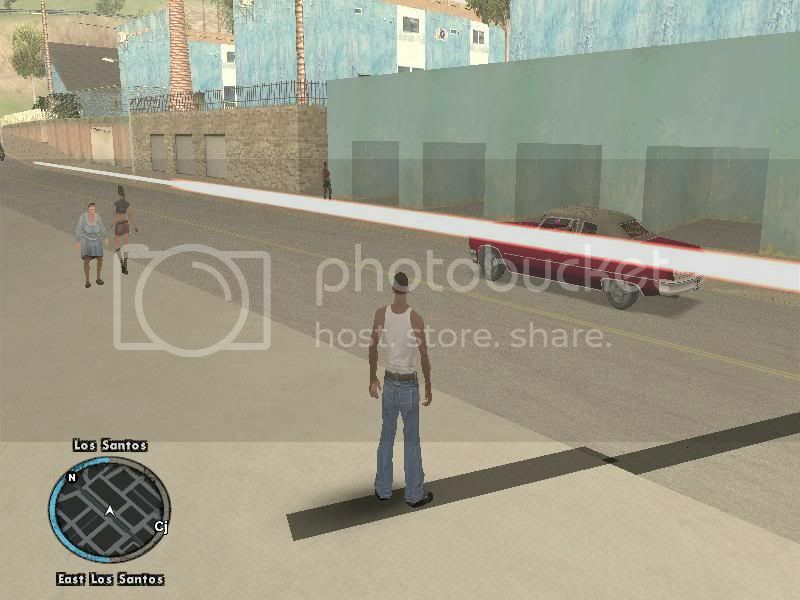 Would it be possible to make proper taser effect, like some GTA IV mod has? Thank you ZAZ for the awesome scripts that makes testing easier i guess cleo loves playmode 0 i will send you the new OD version soon with the updated fireball ! But how ? you used a mod to alter your fps or something ? or did you just enable the frame limiter ? I can't really seem to understand how it moves in motion from the pictures, a video would be better ? Sure, i like to do these kinds of stuff, Try the effect called (taser) let me know if you want it to look different, because those IV effects were meant for broken lamp posts i think. For the first tlaser I couldn't see the laser at all most of the time and only saw it flash occasionally but tlaser2 is much improved. It flickers but at least I could see it haha. The laser also seems to get smaller at different angles and bigger when viewing it from the side too but the flickering bugs me more. Huh... that's weird. Sorry I can't help since I don't know much about effects but good luck getting it to work! I also tried taser which was awesome but firenars wouldn't show up sometimes. and thanks for the small firenar! Looks very good, but now it is a bit too big. It means to be more like electric from wires, or something. And it would be way more suitable for my mod if it would be looped, like that IV vid has. However thank you very much And which textures that effect exactly uses? I don't need those all effects, so I'd cut only that one requested taser. hey guys, will you be releasing the nuke effect too? What about effects to the head shot? other then blood squirting, little particals go flying. 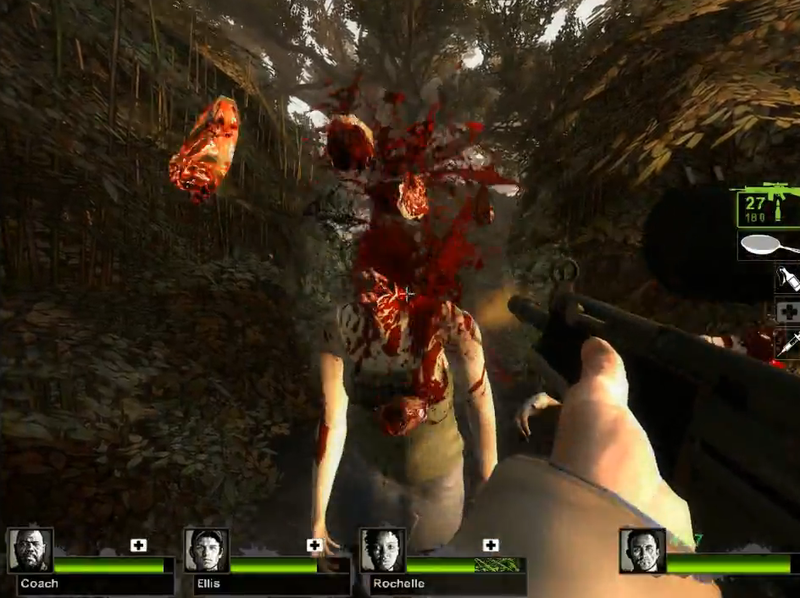 Like this Example from L4d2. Sorry guys for the long delay, I had some internet connection problems. So i did 4 versions 2 short ones(blue/red) and 2 long ones with bugs, maybe if you can perform a line with cleo they wont have this bug ? And i did the rail explosion, it's not too fancy, but maybe if you can find a footage about the real thing it will be better. @SilentPL: Ok i did 3 versions, if sizes are bad or something let me know. @jayd00: i did the blue ball without the rotating sparks, They need too much testing, i will do them later. I did 3 versions for everybody this time, So no more unnecessary effects. @jtr007: What a coincidence, I just did this effect from a couple of days and i showed it to ZAZ. If you want i will upload it for you. A bug? Well I tested all four and they all seem to flicker the same way so I stacked multiple particles on each other and the flickering reduced. As for the long lasers it looks like half of the laser is bigger when the camera's close to that half while the other half is thinner from far away. Is this the bug you meant? And for the railex I saw the flash of light at the center of the explosion but I didn't see the expanding rings that occur around it. Not sure why. Also I noticed that the particles disappear when the camera is far away from them. Is it possible to have them be visible from farther away? but can you make it more smaller? Ok, my friend wrote a script for me for the predator model switching idea. After testing funtion x's electricnar, i made it a little smaller and it looks pretty cool. 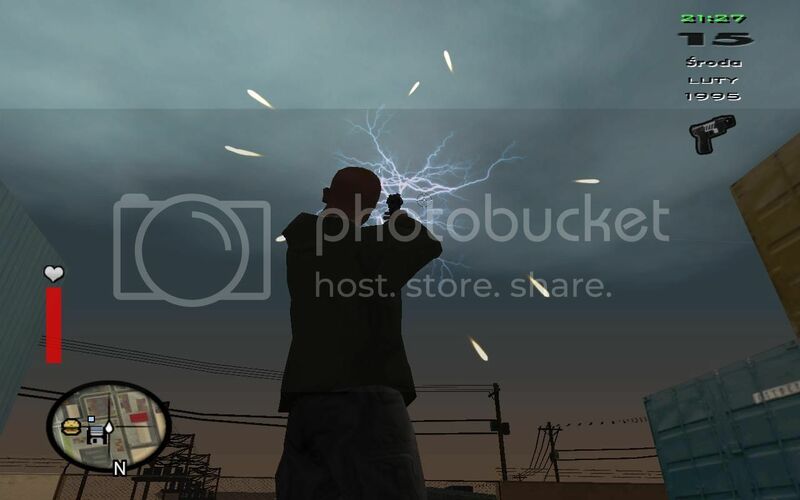 If we want to include the elecrticnar in our mod would you let us funtion x? It's nice. I don't think so.. he made that particle for me xD and you're talking about a big mod. Thats fine. I dont want to steal your particle. I just figured i'd save him time thats all. Any type of electricity predator cloak type particle is more than sufficient. thanks guys! create some cool cleo "ki weapons" like what you can find on dragonball z. ive wanted somebody to make a dbz total conversion for a while now. For the rail explosion, I'm not really sure why you couldn't see it, try it at night maybe you couldn't see it because it's too white and bright, And spawn it like an explosion. @jayd00: Okay done, But i didn't do the sparks yet sorry. @kal-el5676: Use the effect predator1 at the moment when the cloaking begins, Attach it between his feets, And use predator2 like the electricnar, attach it to the chest. Funtion x, it's great! Thank you so much!!! You rule! However i would like to add it to a modded set of particles, and it won't work for me. If you have time, could you add it to these particles please? And thanks again!!! I will of course give you credit when the mod is released. NGE ? I can't really do that because it's not my effects and i don't have permission to edit it, You should ask [sAK*]KING_OF_SA to do it.